Now that you understand the working conditions and you’re excited about the earning potential of working as a processor, you’re curious to know what exactly the jobs and tasks are that you will be performing? 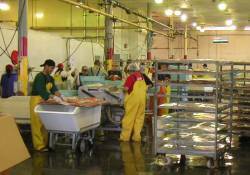 Here we outline some of the specifics behind Seafood processing jobs and job titles. Belly slitter: A belly slitter does what else? They split the belly of the fish from the throat to the end of the abdomen. Afterwards, the fish is sent on to the next station. Gut puller: Usually right after the belly slitter comes the gut puller. Fish guts, eggs, and sacks are removed from the abdomen so the fish can be cleaned. In several plants a machine might perform this job. Head decapitator: This is a machine usually run by one or more people. Fish are fed into this machine, which removes their heads. Afterward, the fish move on to the next station. Spooning: A spooner will remove anything left over in the fish’s abdomen that the gut puller missed. This also includes any organs left over. Washing or Cleaning: In many large plants this is a machine, a lot like a dishwasher. Hoses of cold water are used to clean the fish thoroughly. The machine is usually run by two people or preformed manually by a few people at this station. Grading: Fish graders are at the end of the slime-line. They examine the fish based on grades and then separate them. The grades are as such: 1=excellent, 2=good, 3=fair, 4=mushy (not fit to be eaten). They are then sorted into respective bins. Sorting and Weighing: This can be two jobs separately, or one in the same. Fish are weighted and placed into weight category within their grade. They are then sorted into appropriate bins with other fish of similar grade and weight. Stacking: Tray stacking involves taking sorted fish and placing them onto rolling trays where they will be transferred into the freezer. Glaze line: Frozen fish are taken from the trays and washed in a brine solution before packing by workers in this position. Packing room: Frozen fish are packed according to shipping classifications. Boxes are labeled, moved and organized by these workers before shipping. Iron chink machine: Sounds crazy doesn’t it? Well, these machines are very important to the fishing industry. They were created in the 30s and are still used today albeit a bit more sophisticated. In canneries, these machines removed the head, tails and fins from fish. Usually two workers feed salmon into these machines (which vary according to the plant) and oversee the processing that the machine does. The machine guts and separates eggs and sacks. Canneries tend to only process pink (humpy) and sockeye salmon while other fresh frozen facilities process all types of salmon. Slime table: These workers take care of anything left over from the iron chink machine. Abdomens are cleaned and the gutting finished. Fish are also graded here and then fed into filler machines where fish are placed into cans. Patch cutter: Because some fish are too big, too small and others just right, patch cutters cut the outliers into small pieces that are placed into cans in order to assure the cans are at the appropriate weight and that as many fish as possible are being used. Filler: A filler is a machine that slices and dices fish so they can fill cans. One of two people over see the machine to be sure it runs smoothly. Patching table: Cans that haven’t reached the appropriate weight are sent to the patching table where workers fill them to the desired amount and weight. Afterwards, they are sent back to the line where lids will be placed on top. Cooking (retorts): If you want to stay warm and dry, then this is the place to work. After cans are finished and equipped with lids they end up in large rolling bins. Several people assure that they are loaded properly and placed into retort cookers. End of line: A crew is in place to specifically remove bins full of cooked cans and see them to the cooling area. Dock crews, often known as beach crews: Workers greet boats on their way in from open sea. They help deck hands onboard unload fish and aid in any sorting that can be done before the fish are sent inside for processing. This can vary depending on the boats that unload at your specific processing site. Tenders for example, unload in a different manner than other boats. Ice and bait: Working here means you are supplying ice and bait (often times other items too, like groceries and snacks) to tender boats or other fishing vessels that work for the processor. Sounds a bit like a Costco drive through for boats, doesn’t it? Britestacks: A britestack worker oversees that machines load and stack processed cans so that they are stacked properly. Several people work on this task at once. Night clean up: A clean work environment is critical for the fishing industry. Since work crews share shifts that essentially run for 24 hours, those who work at night will most likely be cleaning. Rinsing bins, equipment and sterilizing machinery reduce the risk of contamination and make the working environment safer. Forklift worker: This job is usually done by a more experienced processor. The tons of fish that accumulate in storage, bins and in crates, need to be moved. This is done by a forklift driver, who is well trained in the machinery. Truck loading: Working out of a warehouse, truck loaders move boxes of fish onto appropriate carriers that transfer the shipments to airports. Office staff: Office staff is often a very highly sought after job. It can involve payroll, accounting, scheduling and closely resembles reception or secretarial work. Office staff usually work long hours and are filled by processors who have worked a season previously or who have some good connections. It goes without saying that office work positions are the driest and warmest of the bunch. Fresh frozen plants make large supplemental profits by selling eggs to foreign companies. Salmon roe (eggs) are considered delicacies in many Asian countries and popular buyers often include the Japanese. Therefore, in many processing plants egg houses are in place to process the eggs for shipments. Egg houses are usually quieter, dryer and more mundane than other processing jobs. They arrive already removed from the fish and are ready for egg house workers to process. Jobs in an egg house can vary depending on where you stand in the processing line. For example, eggs arrive from the main floor already removed from the fish. They are removed from sacs by slimers and then weighed, graded and washed in a solution. They are put into boxes according to type, weight and grade, sometimes salted and then boxed for shipment. Some houses make expensive caviars and almost every egg house is overseen by a specialist from the companies that receive the eggs. These quality control specialists oversee the entire process and make sure their companies will be receiving the eggs in a specific desired state. Egg houses are a great place for women to work because the handling of eggs require small hands and precision. Anyone working in an egg house however should be prepared to work long hours.